Ganesh Chaturthi is celebrated by Hindus from Maharashtra state of India and some other parts of South of India to honor Lord Ganesh, the Hindu deity that is regarded as the remover of all obstacles and the harbinger of auspicious beginnings. People do 'murti stapana' (literal meaning is idol installation) in their homes and perform prayers for either one and half day, 5 days, 7 days, or the entire 11 days based on the customs of the family. At the end of the celebrations, 'murti visarjan' occurs (literal meaning is idol immersion) where the Lord is submerged in a body of water with lot of fan fare. According to Kalyani Bhat, who has taught religious classes in the Dallas Fort Worth Hindu Temple for 8 years,Ganesh Puja was prevalent in Maharashtra since ancient times, but Shri Bal Gangadhar Tilak revived it to great dimensions in modern times. Some people mistakenly believe that the day celebrates Ganesh's birthday, but that is Ganesh Jayanti which falls sometime in February. Ganesh chaturthi is believed to be the day on which Lord Ganesh comes down on earth to bless his devotees. Ganesh Chaturthi In USA ..
Marathi Indian Americans in USA essentially usher in the fall and winter festivities with Ganesh Chaturthi that is soon followed by Karva Chauth, celebrated by north Indian women, Diwali, celebrated by one and all of Indian origin and of course the all important Halloween, Thanks Giving, Christmas and New Year Eve celebrations that are as much a part of our festival period as any of the 'desityohaar' (Indian festivals) are. In USA, Ganesh Chaturthi is celebrated with fun and fanfare, sweets and devotion. People make fresh sweets like 'modak', 'peda' and 'shrikhand'. They do 'murti stapana', pray to the deity with devotion and offerings of fresh food and sweets for mostly one and half days, in some families for the whole 11 days. Friends visit to participate in 'aarti' (prayer) and eat delicious food. The week long gatherings are much anticipated. However, there are no street celebrations- no singing, dancing and certainly no groping, touching. Not just the women, even mother earth has been spared the disrespect that has been shown to her for years during the celebrations in India. Geeta Sule of Dallas, Texas, says, " The eco friendly way of doing Ganapati is that we do the actual puja on a betel nut and do its visarjan( immersion) in our backyard in a small pit filled with water. It is biodegradable. The actual murti goes back in our puja. It is recycled every year:)". They have been doing this for all of the 20 years that they have lived in America, not wanting to pollute the water bodies. 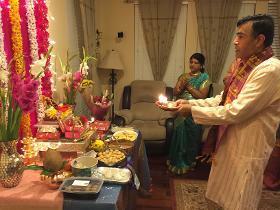 The Bhat family has been following the same ritual for over 20 years of living in America, as have other families of Indian origin all over America. Ganesh Chaturthi In India .. In India, apart from the individual families and small community events, large scale community events are also organised where, on the final day of worship, Ganesha in all his glory, is carried to a lake or a beech in a grand procession where He is immersed in water along with all the pieces of clothing and jewelry that adorned Him. Over the years, this custom has posed severe post-celebrations clean-up challenges, not to mention the serious environmental damage caused to our water bodies and the living creatures that live and/or depend on them. However, the good news is that environmental awareness has been on the rise in India, causing several well meaning devotees and businesses to go green. People are being encouraged to symbolically dip their idol in the water before taking it back home and re-using the same next year. Green Ganeshas are being manufactured which are made of clay ( as was the original tradition) or other bio-degradable materials like recycled paper, rather than plaster of paris that took over as the manufacturing material due to ease of molding. People are being educated about the toxic effects of the lead based paints and plastic ornaments with which the idols are decorated. Anupama Vemuri, in Hyderabad, India, like many others in India, used Ganesha made out of black soil (picture above) that they later immersed in a bucket of water that was then poured over in the flower beds. The bad news is while there are well meaning people who are taking the good suggestions, there still are thousands who are not. With the result, India's waters and the life that it sustains suffers. Not to mention the huge cost involved in the post celebrations clean -up. If people of Indian origin living outside of India and a few wise people in India, can perform the very auspicious rituals associated with Ganesh Chaturthi in an eco-friendly manner, what is stopping the educated class of India from doing the same (those who are not)? Is it the competitive spirit that drives them to have bigger and better Ganesha than the neighboring community or the next door neighbor? Is the celebration driven by some misconception that larger the idol, more the devotion and hence more the blessings? Do they seriously believe that our religion demands it? Do they not realize the huge cost that government or private groups have to incur in order to ensure some degree of clean-up afterwards? Are they totally unaware of the ecological balance that they disrupt in nature, or at the very least can they not see the sheer trash they generate? Surely it can be none of the above because none of the above can possibly appear logical to any reasonably wise person? So that begs the question, are the people foolish?? If they are not, it's high time they prove it!!!! After all, don't we take pride in the fact that Hinduism is the most flexible religion there is? That it is one religion that allows you to question, understand, adopt and adapt? That it allows you to shun. modify, modulate the practices that you don't believe in? Come on people, keep your obligation to mother earth and mankind! Let's not curse mother nature as we take blessings from Lord Ganesh! Ganesh Chaturthi is celebrated by Hindus from Maharashtra state of India and some other parts of South of India to honor Lord Ganesh, the Hindu deity that is regarded as the remover of all obstacles and the harbinger of auspicious beginnings. The Sule family has been bringing Ganesha home all of the 20 years that they have been in America. On the left is the Ganesha setup at the Sule home and on the right is the bhog, the offering to the Lord. The Sule residence turns into an open house on day 1 of Ganesh Chaturthi as friends pour in for aarti and prasad. The Bhat family (pictures below), has been celebrating Ganesh Chaturthi with elaborate Ganesha display (seen below is Sanjay Bhat performing the arti), food and sweet preparations, friends and family gathering at aarti time for over 20 years in America. Many from and in Maharastra and even South India, perform Gauri pooja during Ganesh Chaturthi. According to Kalyani Bhat, who has taught religious classes in the Dallas Fort Worth Hindu Temple for 8 years, "two idols of Gauri are brought signifying two sisters of Ganesh visiting during His visit. Some bring a single idol. Kavita Sathyanna, originally from Bangalore, India, says, " It's been a tradition in my family for many years, since I was a kid, to drape a sari on Gowri, adorn her with jewelry and do a new design for rangoli every year. The house is decorated starting from the front door in fresh flowers, Ganesh statues and rangolis to set the theme. We celebrate with tons of sweets, traditional south Indian festive food and lots of friends. I use silver Gowri and Ganesh for pooja rather than the clay ones. When I moved to the USA 18,years ago, eco- friendly Ganeshas were not available so I switched to silver and it has been a tradition since. " Ganesh Chaturthi is to Maharashtra what Onam is to Kerala, Navaratri is to Gujarat and Durga Pujo is to West Bengal- a festival spanning over multiple days, marked by traditional saris, beautiful decorations, religious songs, daily aarti, and creative art- all to honor the Hindu deity Ganesha, the remover of all obstacles. Although the festival is celebrated in the South as well, in Maharashtra it takes on a different fervor. The credit for the much higher scale of festivities in Maharashtra goes to Bal Gangadhar Tilak, India's famous Independence activist, who in 1894, transformed the private celebrations into a public event, Sarvajanik Ganeshotsav, characterized by processions, music and dance. The large public gatherings were means of opposing the British colonial rule. The large gatherings during murthi stapna, and daily aarti, and huge processions with loud chanting of 'Ganapati Bappa Moriya' during murthi visarjan (literal meaning is idol immersion, where the Lord is submerged in a body of water with lot of fan fare) even today characterize the celebratory style of the festival in Maharashtra. Mumbai is the capital of Ganesh Chaturthi. Mumbai, being the site of the Hindi film industry where celebrities abound, also witnesses star participation thereby adding stellar proportion to the crowd gathering.